We're all about common sense Access Control! You don't have to spend thousands of dollars for Access Control. You CAN, but you don't have too! With an inexpensive Wi-Fi camera, you can monitor your main entrance from anywhere in the building on a smart phone. Controlling the door, until now, meant going to the door or a control button in the front office. With our Q-Box controller, you can control access from your 2-way radio! The Q Box in your choice of High visibility green or basic black mounts anywhere. The Q-Box can operate from 12 VDC power supply normally used with magnetic door lock systems or three easily replaceable "D" Cell alkaline batteries that last for up to 7,000 activations before replacement is required. Check out info4u.us/O-Box-for-schools.pdf or give us a call at 205.854.2611 for more information! 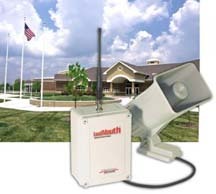 We also offer sensible and affordable mass notification solutions that allow radio control of wired intercom and or PA systems as well as the integration of wireless PA systems to serve remote areas. Learn more about the EvacALL solution below! Our government does some strange things! For example, they create and enforce federal safety standards to protect large numbers of people (like in a manufacturing plant, but they don't apply these same standards in SCHOOLS! Maybe the small and the young are not considered "people". However, we think that providing a means of quickly notifying and evacuating "people" is as important in a school as in a manufacturing plant. That is why we offer the EvacALL for your consideration. The EvacAll wireless notification system uses LoudMouth technology for quickly alerting large numbers of people in times of emergency. EvacAll is especially well suited for compliance with OHSA safety standards (20 CFR 19 10 (165(b) for mass alerting. EvacAll provides three methods of alerting - a flashing strobe light, an audible musical alert tone, or a voice message. The system uses a wireless VHF or UHF receiver, coupled to an internal message recorder and playback unit through a high powered audio amplifier and directional horn speaker for maximum audio in noisy areas. The CS100E personal 2-way radio with an internal alert generator is used for activation Click here for additional information! An adapter, known as the LPA is optionally available for use with existing PA systems. For less than a thousand dollars, a standard wired PA system can be activated by 2-way radios and/or wireless call buttons. For additional information, call us at 205.854.2611. Now let's move on to learn about infrastructure, what it does, how it works, and how it can save you money. Click here for more information!